Getty Images has joined EU’s antitrust investigation against Google as an “interested third person” this month. They are taking Google to task for what they feel are issues caused by Google, specifically with image search, that hurts both their sales and Google traffic. But when you look at it a little close, what is interesting is that most of Getty’s claims can be attributed to the current stock photo market and their SEO… and not so much Google’s image search. Getty Images ranks very well compared to other stock photo sites. In fact, for the search query they included as an example, they rank in the top organic spot. Yes, the #1 rank. Oh, and the #2 spot? iStockPhoto, which is also owned by Getty. I am fairly certain their competitors would be pretty happy about those top two spots. Head to the second page, and there is Thinkstockphotos twice (once for .com and once for .ca) which, you guess it, are also owned by Getty. In their press release, Getty argued that Google is placing them at the bottom of the first page or even on the second page of results. Obviously, Google can’t guarantee any website top placement. However, even though Getty does rank #1 for this example – and for many others – if they didn’t rank, it would be a search engine optimization issue. Web search results that link directly to the Getty Images website are placed low in the search results, frequently, and remarkably, not on the first page of results. If they feel they aren’t ranking well enough, it means they need to look at their SEO and see what they could be doing better. 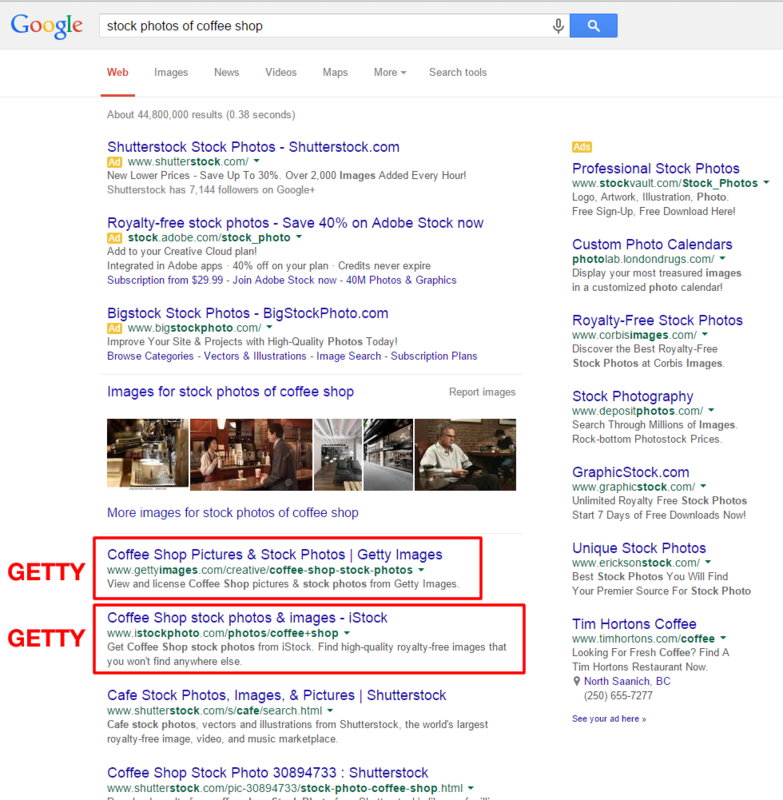 They argued again that Google was demoting Getty in the “general web search results” as well. Google is accused of using images that are owned and/or distributed by Getty Images to build and promote its own image search vertical, while demoting the appearance of original content providers like Getty Images in general web search results. Doing a search for “stock photos” shows Getty on the second page with their iStockPhoto site ranking in the #1 position overall and Thinkstock also on the first page. Getty also feels that Google is costing them revenue because they have fewer visitors from Google search results. Getty Images’ revenue growth has slowed because fewer people are coming to its websites from Google search pages, which means less of its content is being licensed and purchased, according to a person familiar with the situation. But again, with so many competitors in the space, and Getty likely remembering a time when they were the only stock photo site in the market, there is definitely room for them to improve their search rankings. And it is obvious that other stock photo sites are above them in the results, which means that there could be work done on Getty’s SEO strategy. Here is what Getty Images’ rankings look like, according to SEMRush. Now when you compare Getty to one of their biggest competitors, Shutterstock, it is clear which site has the better working SEO strategy. And according to SEMRush, Shutterstock has 3 times the top 3 rankings that Getty has, with over 25k more top 3 search results. One of the complaints is that Google is placing the image results above the organic search results. However, this isn’t exclusive to the term “stock photos.” Google will often show the image results much higher on the page when the query suggests that the searcher is looking for photos or images. Getty also ranks fairly high in the image results as well, with their first result showing up in the second line of image thumbnails. Here are the image search results with Getty’s images highlighted in red. They complained about Google using their images in image search. Getty Images also complained to the European Commission that when Google shows large, high-quality Getty-owned photos and puts them on its own Image Search service this encourages people to copy the images for their own use, potentially infringing photographers’ copyright. However, the Getty watermarks are clearly visible in each of the photos shown in image search, as are they in the cases of the other stock photos on the results page. They also claim that Google makes it easy for someone to save an image in Google search. Furthermore, with its large-format display, it allows end users to easily copy the images by simply “right-clicking” on them, resulting in massive theft of original content. However, it is also worth noting that Getty makes no attempt to prevent people from right clicking on the images on their own site either. They also claim Google isn’t linking to the original source of the images. As a result of these changes, Google has succeeded in driving additional traffic to itself and created a captive environment that ensures that traffic on Google almost never diverts to the source sites of the images – source sites like Getty Images and other specialized image search companies. But looking at the image results for the example, every single image shown was linked to the original stock photo site source, with information on how to purchase. Here is the first image result from Getty. You can clearly see the Getty watermark and the URL for the image pointing to www.gettyimages.com (along with a pretty impressive keyword list). If They Aren’t Happy With Image Search, Why Not Remove Their Images From It? Getty is clearly unhappy with the fact Google has their images in image search, yet they haven’t made a single move to remove those images, either. Getty can remove any or all of their images from Google’s image search, which they haven’t done. They can prevent Google from indexing their images and displaying them in the image results by using either robots.txt as well as using Google’s URL removal tool. This positioning drives more traffic to Google Images, even when it’s not the best offering for consumers, Getty argued. That’s because Google Images includes photos from other websites and publishers, rather than original, licensed content, the firm said. Really, what they mean is that Google is making it easier to find Getty’s competitors, because those are all the competiting sites showing in the image results… not sites that Google owns themselves. They argue that Google Image Search is not an acceptable way for people to find stock photos from legitimate sources. However, searching in Google image search including the keywords “stock photo” is a great way to search multiple stock photography sites at once to quickly find the perfect stock photo to purchase. Getty’s wording of Google’s image search makes it sound as though Google is a competitor who is offering their own stock photos for sale. But in fact it is simply a search result listing for images, many which happen to be competitors to Getty, as well as Getty and all its related companies. But with many people unfamiliar with Google’s search results, this could be easily confused where people misunderstand and believe that Google is selling their own stock photos in competition with Getty, not simply the fact Google is displaying them in image search. From the perspective that Getty is arguing, there is no use for image search at all, when users should be searching sites like Getty instead. However, Getty fails to acknowledge all the uses for image search where they wouldn’t be a useful source. For example, there are parents looking for free printable coloring pages, teachers looking for printable worksheets, searching for photos of a person, searching for a product, and so on. One could argue that Bing’s presentation of this same search query is even more blatant to steer users to image search. 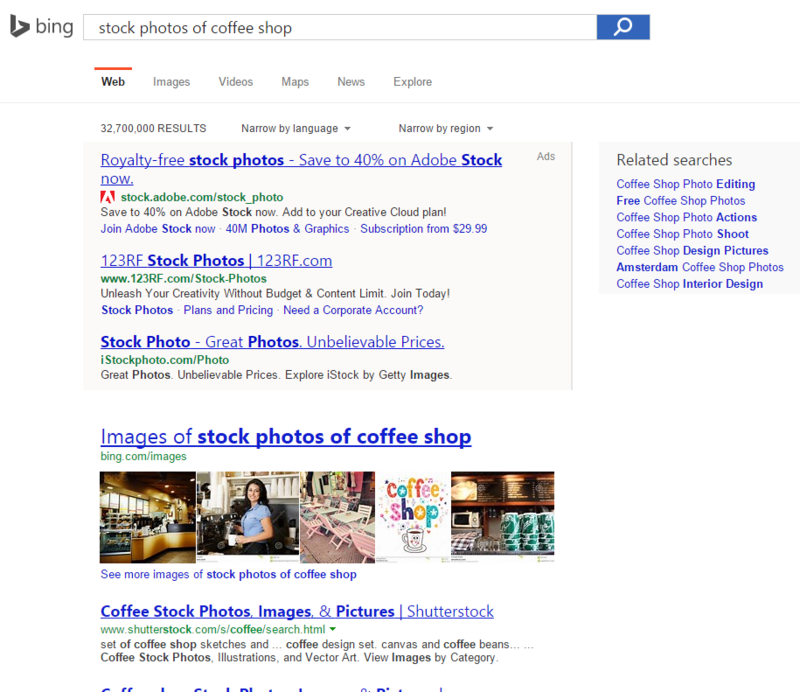 First, an example without Bing Ads displayed at the top, with a huge “Images of stock photos of coffee shop” at the top of the search results. Here is the same search, underneath the Bing Ads. In some results, Getty isn’t even listed on the first page of results. Bing doesn’t even display a single image from Getty in their image results. The Bing results are not at all concise to stock photo results when you compare it to Bing. 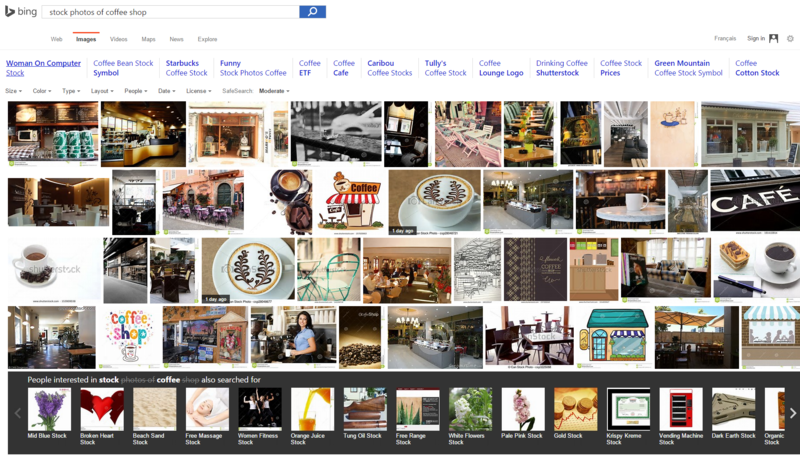 In fact, it would be far easier for a potential Getty customer to find an image they would like to purchase using Google image results and not Bing’s own version of image results. Getty also suffers from some significant usability issues when someone actually is interested in purchasing from them, something that can easily be reflected in the drop in traffic they are blaming on Google. Have you ever tried to buy a photo from Getty? I dare you. 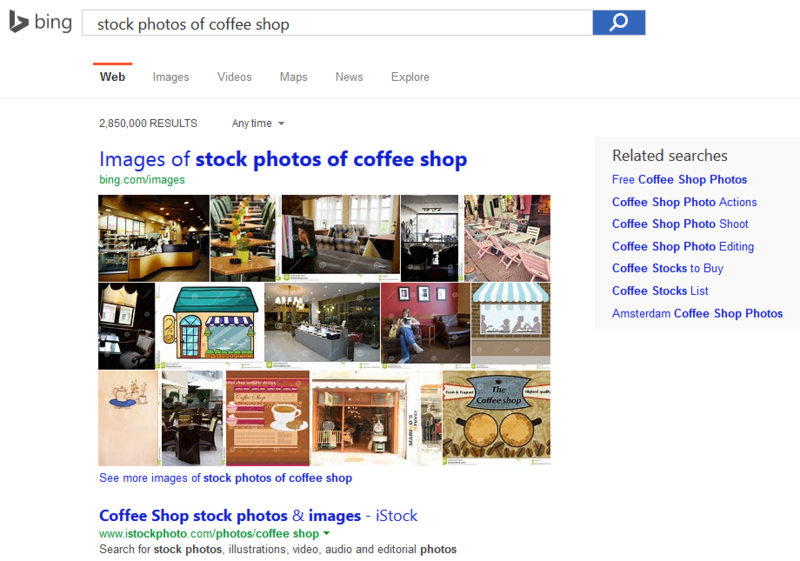 I used the coffee shop example, and chose the first Getty image in the search results and proceeded as if to purchase it. If you are used to most stock photo sites where you pick a size and resolution, well, this is about as far from that easy as you can get. And yes, each of those sections has their own drop down options or radio buttons to choose from, although I could only display one at a time for the screenshot. It has been well known for years that Getty Images is extremely pricey. 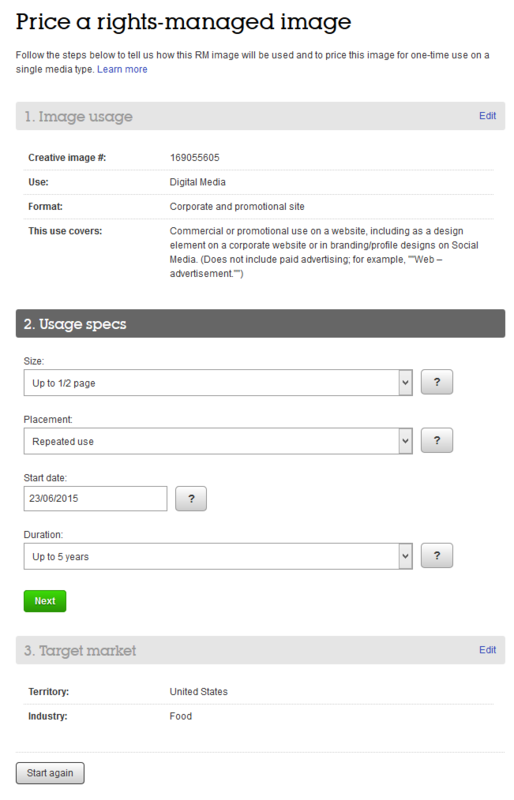 For the above example where I followed the above options, the price was over $2000 for a single image that was only usable for 5 years. By comparison, Dreamstime offers this similar photo for $1. And iStockPhoto (which is also owned by Getty) offers this photo for $36. And Shutterstock offers this photo for $15. So it isn’t hard to see why Getty complains customers aren’t buying photos from them like they used to… however, it would appear better – and cheaper – competition is the most likely culprit and Google is the scapegoat. Another unappealing aspect of Getty when purchasing an image for use, and which most stock photo sites do not implement, is the rights can only be bought for up to five years. After that, the image would need to be removed. While not as important in print media, this is obviously problematic for webpages, not to mention having to have someone keep track of when the rights to images are expired so they don’t receive one of the infamous Getty extortion letters. But They Have Free Ones! It is worth noting that Getty recently began offering free image options, which can be embedded on websites… and of course, it includes a couple of nice links – followed, of course – to the Getty homepage, as well as the page for the individual image. It is a method of linking that could fall into the grey area of whether it is a legitimate link or whether it would be considered a link scheme. While the images are free, you could definitely say that they are benefiting from the many, many links. The embed uses they phrase “view image” as the anchor text, and you can see those free images were worth over 2 million backlinks in this report from Majestic. And only about 200k of those links were no followed… still a net profit of nearly 2 million links. 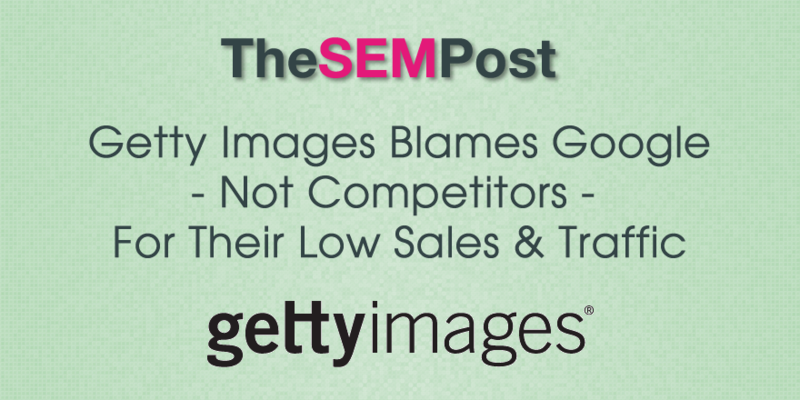 At the end of the day, Getty’s main complaint is that they feel Google should link to them – and only them – and simply send all stock photo search traffic directly to their site, at the expense of the other legitimate stock photo competitors. Clearly other stock photo sites are beating them when it comes to rankings, which means they should be stepping up their SEO game… that is what will get them more traffic. It wasn’t so much that Google was stealing their traffic, it was that their other stock photo competitors were outranking them in the search results. Getty needs to look in the mirror. I’ve been using Istockphoto for years, maybe 10+? I remember when images were 25 cents. This went up over time, but it was still practical to use their images in blog posts and presentations when a small – medium image was a few dollars. Their latest round of price increases, which included eliminating discounts for smaller size images, finally made them unusable for me. 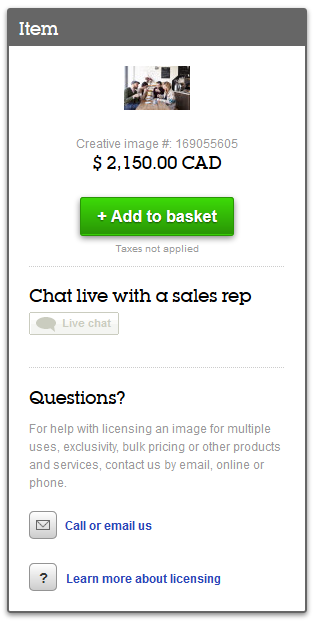 For a blog post that is not monetized, plunking down $15 – $50 just for stock photos doesn’t make sense. And, my presentations have up to 150 slides, so high priced images aren’t practical. I’d like to see a chart of their price per image over time and see how that compares to images sold. I’m guessing that they saw short term revenue lifts but declining unit volume. I have switched to other services and haven’t used istockphoto in months. Blame me, not Google. The image was from Geddy. The client was a lawyer. The website was for a state election. Aren’t you a moderator at Google Inc. Jennifer? Perhaps you should declare conflicting interest when posting? No, I do not have anything to do with Google, as an employee/contractor/moderator/top contributor or anything else in any capacity. I report about Google and many other companies, just as other industry news sites do. Absolutely no conflict of interest from me. I saw the referring thread that mentioned this post. That is an aggregate of info which is taken from various sources without attribution… either it was taken from a session where I was moderating at a conference where Google had a speaker on the panel or from my time – over ten years ago – when I was a moderator at WebmasterWorld for the AdSense forum.